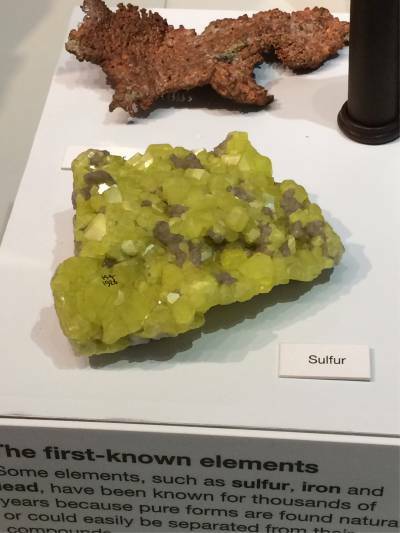 I was visiting an elements exhibition in the Ulster Museum (Northern Ireland) and there were these native sulfur crystals on display. My question is how do sulfur crystals like these form in nature? Does the sulfur precipitate out of a solution? Are they the product of a chemical reaction? I am confused because of sulfur's negligible solubility in water and I couldn't imagine any other way such perfect crystals could form. I am really interested in making such crystals myself but as I have said, I don't know by what process or under what conditions this crystallization of sulfur occurs. Browse other questions tagged inorganic-chemistry recrystallization or ask your own question. Why do sulfur and oxygen form sulfur dioxide? Is +6 really the most stable form of sulfur? Why does sulfur form S8 instead of S3?